A standard textbook for 25 years, Surgical Exposures in Orthopaedics: The Anatomic Approach is now in its Fourth Edition. Featuring 775 full-color illustrations, this atlas demonstrates the surgical approaches used in orthopaedics and provides a surgeon's-eye view of the relevant anatomy. Each chapter details the techniques and pitfalls of a surgical approach, gives a clear preview of anatomic landmarks and incisions, and highlights potential dangers of superficial and deep dissection. The Fourth Edition describes new minimally invasive approaches to the spine, proximal humerus, humeral shaft, distal femur, proximal tibia, and distal tibia. Other highlights include new external fixation approaches for many regions and surgical approaches to the os calcis. New illustrations of the appendicular skeleton are included. New drawings show the important neurovascular structures that need to be protected. At all levels of orthopaedic training and practice, Review of Orthopaedics, by Mark D. Miller, MD, is an ideal, state-of-the-art resource forefficient review of key orthopaedic knowledge and board prep. Thoroughly updated, this edition helps you ensure your mastery of the very latest scientific and clinical information. Focus on the concepts you are most likely to be tested on. Every chapter has been carefully compared to the most recent OITE and ABOS self-assessment exams to ensure that the content covers everything you need to pass.and nothing you don't. Presents the very latest developments in the field through thoroughly updated diagnostic and treatment algorithms for all clinical conditions. The must-have Candidate's Guide to the FRCS (Tr and Orth) Examination has been extensively revised, updated and expanded in this second edition. This definitive book - giving guidance on all aspects of the examination and preparation - has been specifically written to get you through the exam. If you are facing the FRCSOrth in the next year or two, you need this book! This edition features five new chapters: surgical approaches, anatomy, SAS doctors, article 14 and the FRCSOrth exam and musculoskeletal tumours. All of the other chapters have been thoroughly revised to improve the content and cover the syllabus more comprehensively. The written section covers the new MCQ/EMI format and includes tips and tactics for success. The numerous examples of actual FRCS (Tr and Orth) cases and viva questions (and how to deal with them) are a gold mine for candidates and help to make this title an essential read. This book has been written specifically for candidates sitting the oral part of the FRCS (Tr & Orth) examination. It presents a selection of questions arising from common clinical scenarios along with detailed model answers. The emphasis is on current concepts, evidence-based medicine and major exam topics. 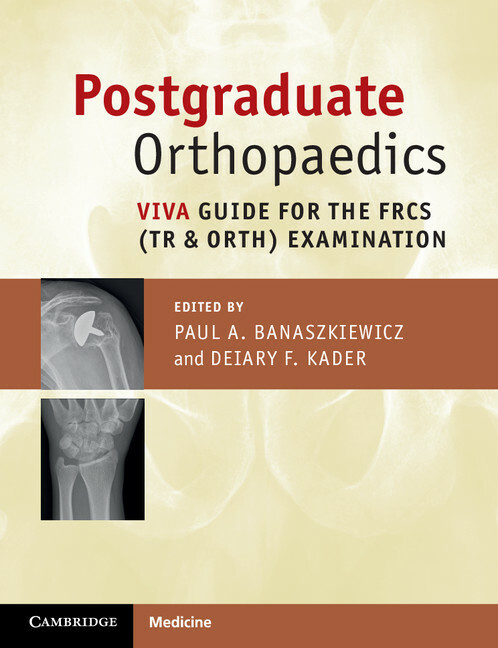 Edited by the team behind the successful Candidate's Guide to the FRCS (Tr & Orth) Examination, the book is structured according to the four major sections of the examination; adult elective orthopaedics, trauma, children's/hands and upper limb and applied basic science. An introductory section gives general exam guidance and end section covers common diagrams that you may be asked to draw out. Each chapter is written by a recent (successful) examination candidate and the style of each reflects the author's experience and their opinions on the best tactics for first-time success. If you are facing the FRCS (Tr & Orth) you need this book.